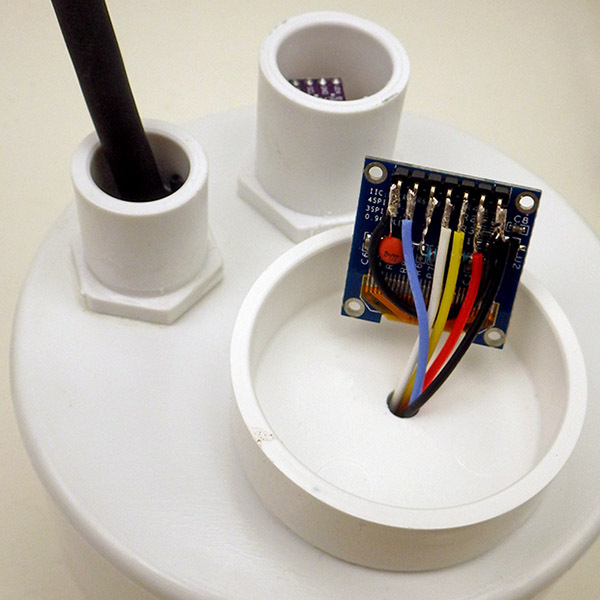 This in-cave micro-climate recorder had pressure & temperature sensors mounted in little wells of Loctite E30-CL epoxy. 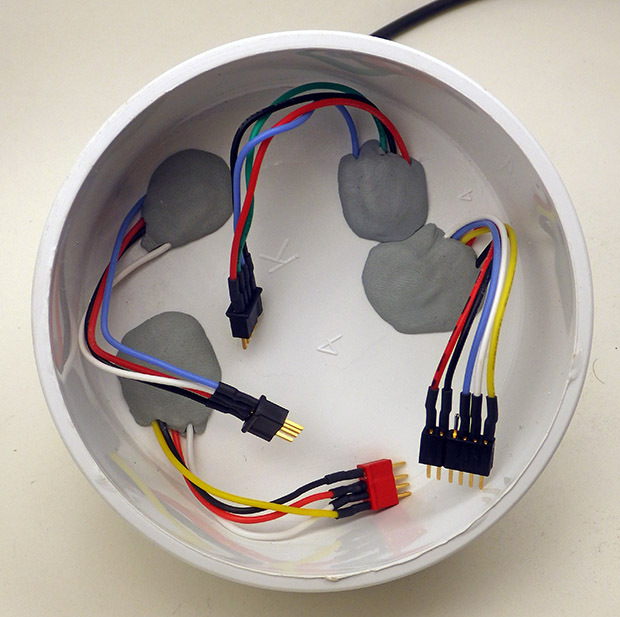 This sensor potting method is described in our Pro Mini build tutorials. Weather sensing stations are the most popular type of Arduino-based Sensor project on the instructables.com website. One thing to note before you start is that many modern sensors will only accept 3.3v inputs, so UNO based projects need to check if the sensor they want to use is 5v tolerant. 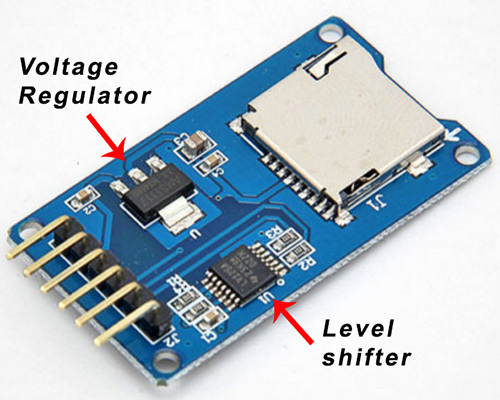 Most sensors from vendors like Adafruit put regulators on their breakout boards to handle this 3.3v-5v translation, but you may have to place level shifters between some of the more advanced digital sensors and an UNO based logger. Occasionally you run into the opposite situation where the sensor requires 5v (or more) forcing Pro Mini based systems to do the same thing. A typical photoresistor divider from Sparkfun’s Voltage Divider Tutorial It’s worth noting that many LDRs go from 100 Ohm to over 1 MOhm. So you would have to change the series resistor to capture a range that large. 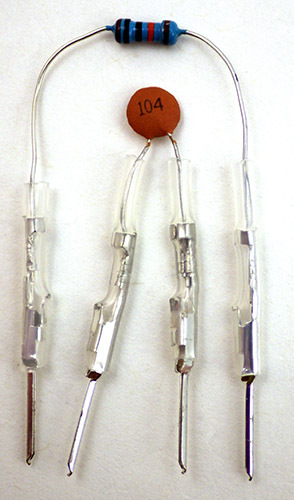 The most common analog sensors are those that change their resistance in response to temperature (thermistors), light (photo resistors) or pressure (& it’s force / stretch / bend variants) If a sensor varies in resistance, you can turn that into a voltage by adding a fixed resistor to create a voltage divider circuit. The non-sensing resistor in the divider is usually chosen with a value near the midpoint of the sensing devices range. For example, a photoresistor might vary between 1kΩ in the light and about 10kΩ in the dark, so a suitable resistor to pair it with would be ~5kΩ. 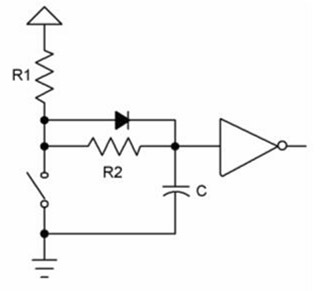 For analog sensors that change by really small amounts, more sensitive Wheatstone bridge arrangements combine 2 or 4 sensors in the same circuit to expand the delta, but it’s the same basic idea: you are converting a change in resistance into a change in voltage. Most analog sensors are simple devices, but there are more complicated versions providing modified analog output, where some extra circuitry has been added to convert the highly non-linear response you get from typical resistance based sensors into the kind of straight y=m(x) relationship you get from a TMP36. This greatly simplifies the math required to convert your analog voltage readings into the real-world property you were actually trying to measure. 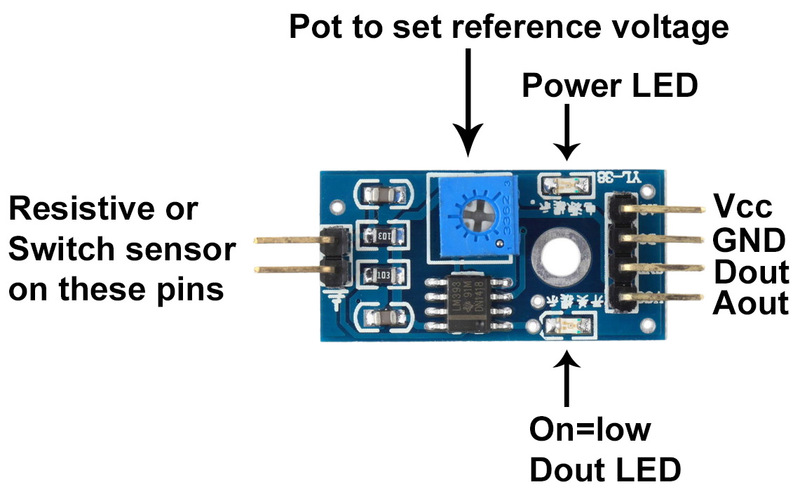 Some analog sensors (like thermocouples) generate tiny voltages, but those signals may be so small that they need to be amplified before the Arduinos ADC can read them, so these analog sensors may also be sold with supporting electronic boards to boost the output. Sensors can be mounted inside a housing with a couple of layers of 3M Scotch Outdoor Mounting Tape. Sensors mounted this way have stayed in place for many years of deployment. The adhesive will sag somewhat under gravity if you expose your loggers to temps >55C. At the top of the analog sensor food chain, there are complex Micro Electro Mechanical (MEMS) devices like accelerometers. 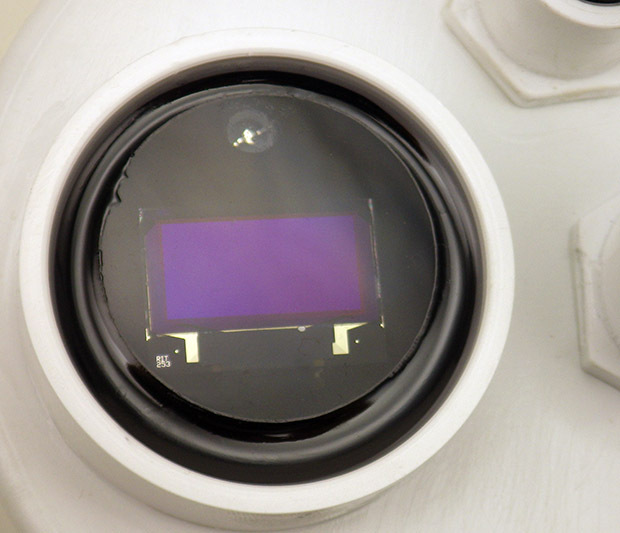 In these sensors, silicon has been machined into very tiny physical devices made from springs, coils and flat sheets. These micro-cantilevers form capacitors that react to movement by changing a voltage and they are usually arranged in sets of three on x,y,&z axes. This means you need to read three separate input pins to capture a complete reading from the device. 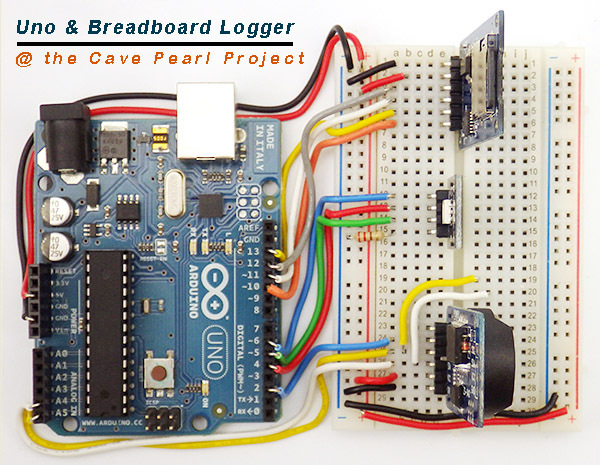 Since the Cave Pearl data loggers use pins A4 & A5 for communications with the RTC module, and A0 to track the main battery voltage, a complex analog sensor like the ADXL335 can use up all of the remaining analog inputs on the logger unless you build it with an Arduino that makes inputs A6 & A7 available. (the Pro Mini does, the UNO does not) The limited number of analog input pins can motivate people to switch over to digital-bus sensors, though multiplexers provide another possible solution to the problem. That’s it. This simplicity is why analog sensors are usually the first ones people encounter when they are learning the ropes. Of course there are some advanced tricks you can play to supercharge Arduino’s humble 10-bit ADC, and you’ll find more useful tips over at Nick Gammon’s ADC tutorial. Unlike analog sensors, digital sensors only output two voltages: High & Low. Usually the high voltage is the same as your power rail, and the low voltage is your system ground. In some ways that makes digital sensors easier to use, but there are some devils hiding in the details, and digital sensors cover the entire range from crude noob level devices to Gordian knots with more computational horsepower than the Arduino itself. 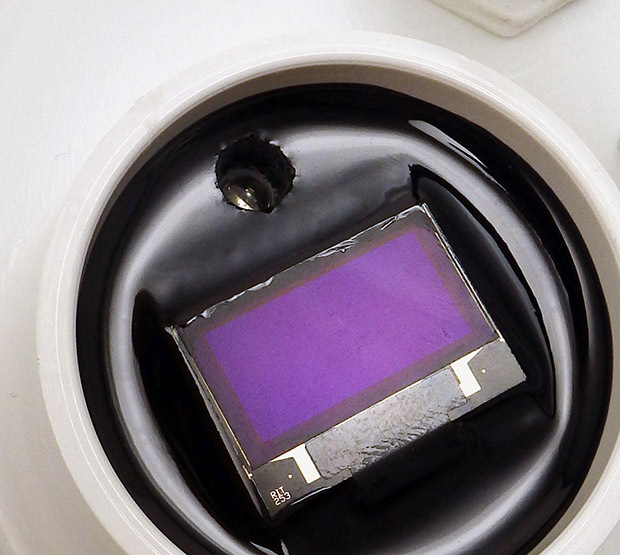 Even the most complicated digital sensor usually has an analog sensor hiding somewhere at its core. This is based on what kind of output they produce, rather than the complexity of their electronic circuits. 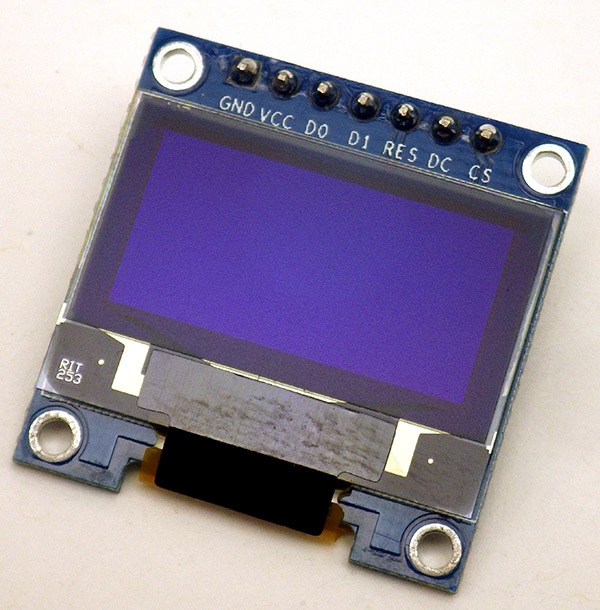 And it’s not unusual for more advanced IC-based digital sensors to be as easy to use as the flippers & thumpers, because some kind soul has released a library that takes care of the gnarly low-level details. The humble push-button can be thought of as a crude pressure sensor that can be in only two states: open or closed. Add a couple of passive components for debouncing, and reed switches become the digital sensor of choice for event counting applications like the tipping-bucket rain gauges you find in weather stations. IR break-beam switches are another common implementation with on/off output. These boards switch their high/low output when the sensor circuit voltage crosses the threshold set by the trimpot divider; and this changes the analog sensor voltage divider output into an environmentally responsive threshold alarm. It’s such a generic circuit, and you could connect other resistive sensor dividers and the board wouldn’t even notice. If you use these modules with the Cave Pearl loggers, look for boards that also break out that 4th analog pin so you can also read the sensor dividers output directly with the ADC if you want to. All the I/O pins on an Arduino can be used as digital inputs (including the analog lines) and the cool thing about that is the circuitry hidden behind those pins inside the microprocessor. The Schmitt trigger on each pin has read-high vs read-low threshold voltages. 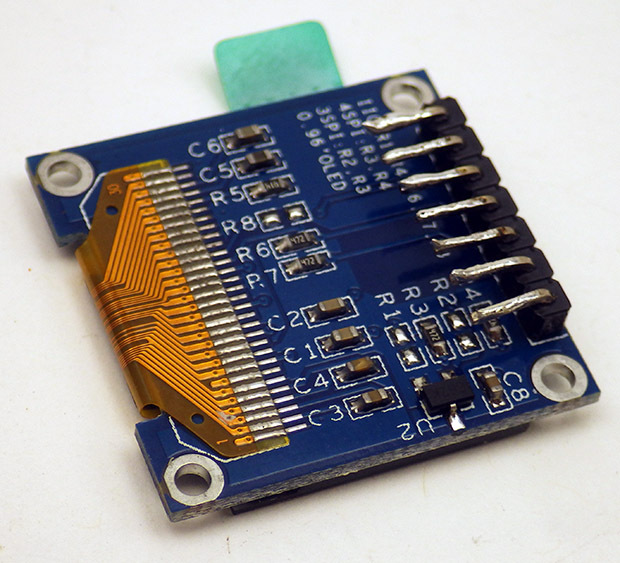 This lets you replicate what those cheap eBay modules do by replacing the fixed resistor in your analog voltage divider with variable one, and then connecting the output of that divider to a digital input pin. Inferring resistance (or capacitance) by timing threshold crossovers on a digital I/O pin lets you make high resolution analog readings with digital pins because micro-controllers count time far more precisely than ADC’s measure voltage. Flippers change state slowly by microcontroller standards, and since they can be read with a single digitalRead() command, they won’t get you much cred at the local hacker-space. To get into the digital world’s caffeine-driven middle class you have to start working with Thumpers. These are sensors which convey information by varying the amount of time the sensor outputs a high voltage at a given frequency (called pulse-width modulation or PWM) OR by changing their output frequency with a fixed 50/50 split between on&off time (this is called frequency modulation or FM) . This kind of output was common long before the Arduino existed because putting an analog sensor into the oscillator circuit feeding a 555 timer chip changes the pulses coming out the other end in proportion to the sensors resistance / capacitance / etc. You’d be hard pressed to find any environmental sensor that can’t be constructed with a couple of op-amps and a 555 (See: the conductivity sensing post for examples). The output of the pulseIn() function is the time in microseconds that it took for the pin to go (or be) LOW, then go HIGH, then go LOW. This is the method of choice for PWM thumpers, and it is extremely easy to use provided the incoming signal is a clean square wave. Unfortunately, it does not handle frequency modulation very well at the high end, because it’s susceptible to errors in timing when detecting the start and end of really short pulses. duration = pulseIn(echoPin, HIGH);    // listen for the echo and return time. // Then divide the duration by 29 cm = distance in centimeters. 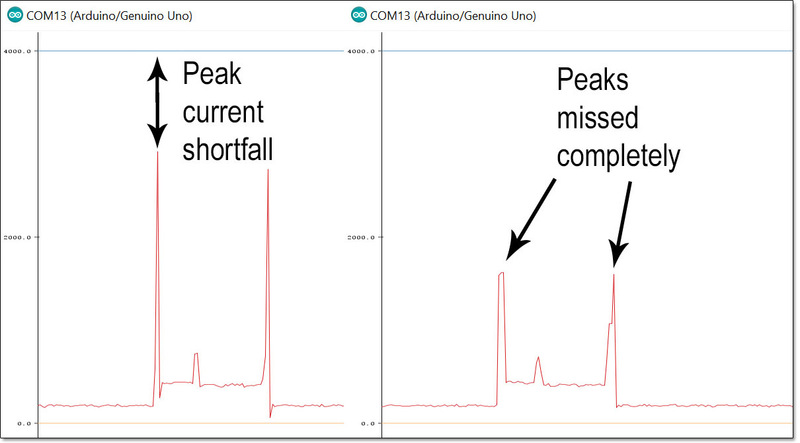 External interrupts handle both PWM and FM efficiently with the limitation that there are only two hardware interrupt lines on a typical Arduino. The Cave Pearl loggers are already using D2 for the RTC wakeup alarms, and that leaves only D3 available for hardware methods calling attachInterrupt(). 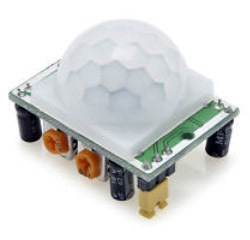 The TSL235R light-to-frequency sensor outputs a square wave (50% duty cycle) with a frequency proportional to light intensity. The TSL235 is self-contained, well calibrated, and very linear over the ultraviolet-to-visible light range of 320 nm to 700 nm. Calibration in manufacturing is something that most companies will try to avoid, and when you include the fact that this sensor works from 2.7-5.5v, you have a $3 sensor that’s nearly perfect for use with Arduino-based data loggers. 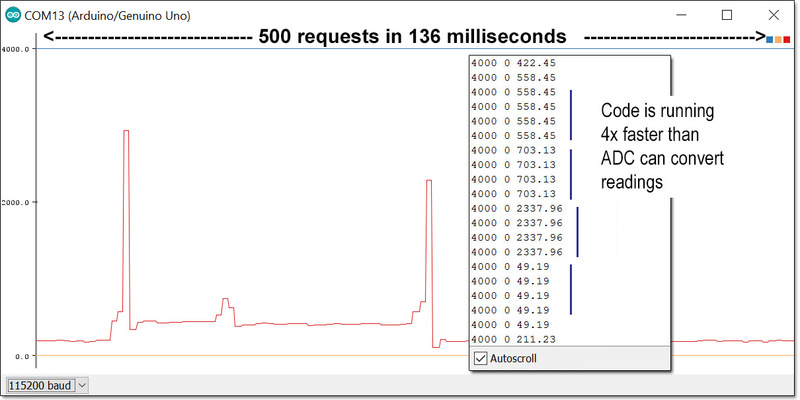 Rob Tillaart has posted a simple bit of code that counts the interrupt pulses per second from this FM sensor over at the Arduino playground. It should be easy to integrate these functions into the Cave Pearl base code, and to modify it to work with any other FM output sensor. Data from light sensors usually requires post processing with somewhat complicated luminous efficiency calculations, but if you Google around you’ll find plenty of Arduino tutorials on those steps (also see: Insolation Models). Only D2 & D3 support external interrupt signals by default, but with a little bit of extra code interrupt signals can be received on any of the Arduinos I/O pins. Interrupts triggered from pins other than D2 & D3 are referred to as Pin Change Interrupts. Pin change interrupts are grouped into 3 ‘ports’ on the MCU. This means there are only 3 interrupt subroutines to handle input from all 20 pins. This makes the code somewhat more complicated than Rob Tillarts example, as it now needs to determine which pin triggered the ISR. That extra complication usually motivates people to use something like the PinChangeInt library for situations with a limited number of input pins. Anemometers often use interrupt-based approaches because they work with output that’s so variable that it can’t really be classified as PWM or FM. 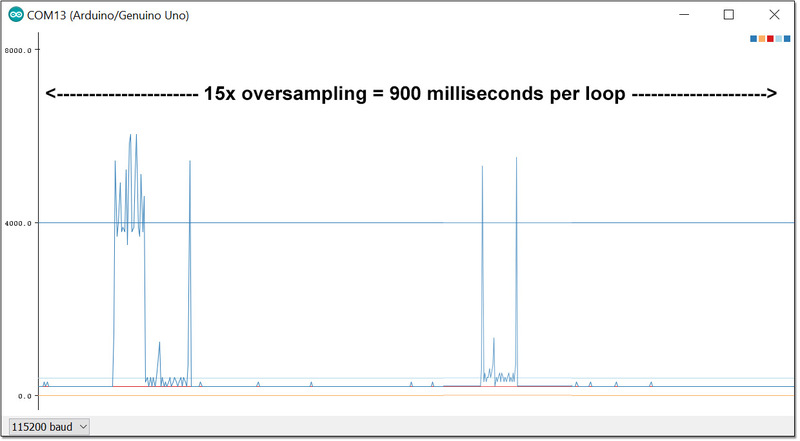 There are many great frequency counting libraries but it’s important to note the difference between ones which count the number of pulses during a fixed “gate interval” time, and those measuring the period of a single high frequency pulse. Rob Tillart’s code uses the counting method, and this works well for relatively high frequencies, because many cycles are counted during the gate interval and this reduces error. At lower frequencies, very few cycles are counted, and the precision suffers, so measuring the elapsed time during a single cycle is a better option at low frequencies. 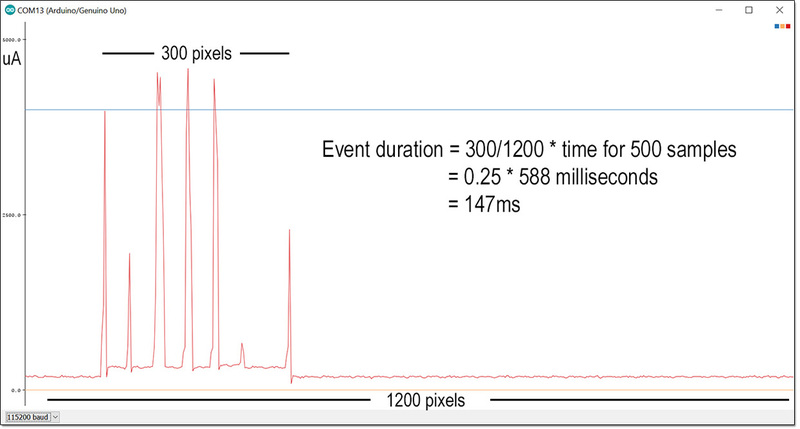 This image is from PJRC’s FreqCount Library page, which goes into more detail on the FM sensing process. 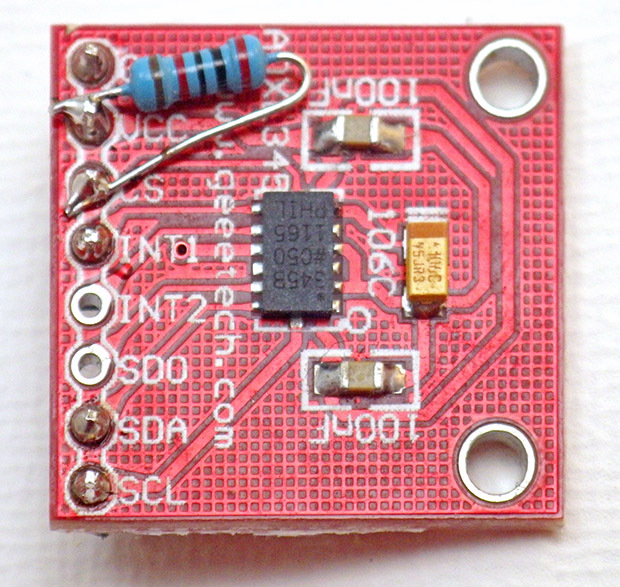 It’s worth noting some of the other useful sensor libraries that Paul Stoffregen has released including: a Onewire library for the ever popular DS18B20 temperature sensor, SerialFlash to simplify SPI memory builds, and their project blog is a font of other highly interesting things. 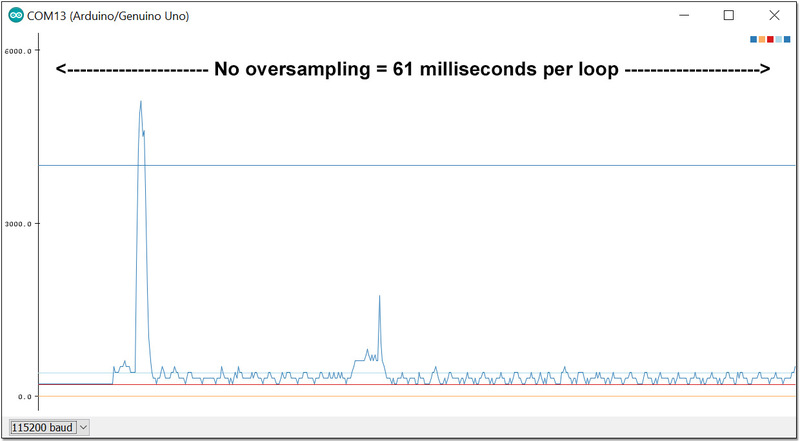 According to PJRC: Frequency Counting: works best for 1 kHz to 8 MHz and Period Measuring: works best for 0.1 Hz to 1 kHz. There is some wiggle room there, and you should check your sensors data sheet to make sure your method matches the output range. If you’d rather skip the libraries, you can get closer to the bare metal with the advanced timer over-flow methods described at www.fiz-ix.com and at Nick’s Timers & Counters page. 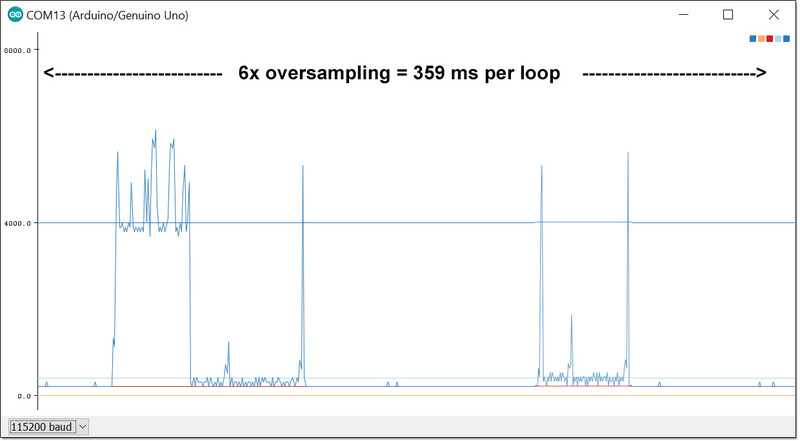 Nick’s page describes a method to measure frequency with the input capture unit on pin D8. While that’s some pretty advanced code, it allows you to measure pulsed inputs to a resolution approaching the frequency of your system clock. 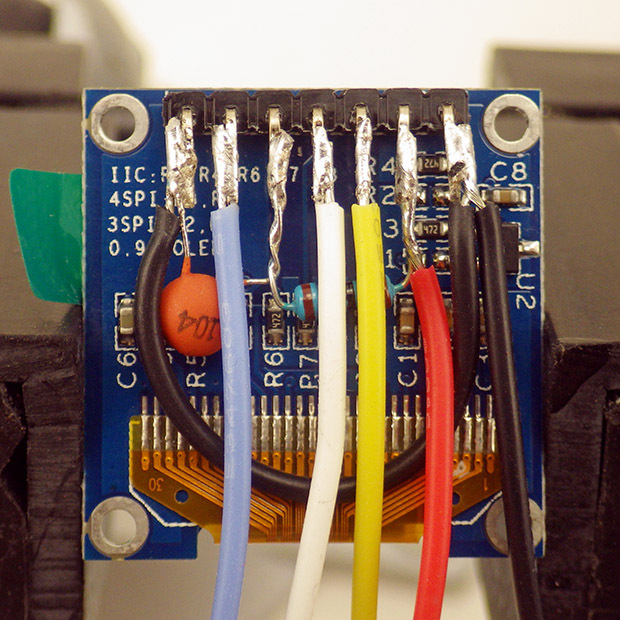 This Grove I2C hub connects several the sensors to the bus, so only one jumper set needs to be patched down to the logger platform. The mounting shown here was done with plumbers putty, which hardens quickly, and adheres well to most plastic enclosures. Modern chip-based sensors offer high resolutions and complex signal processing capabilities that can be hard to replicate on the Arduino. 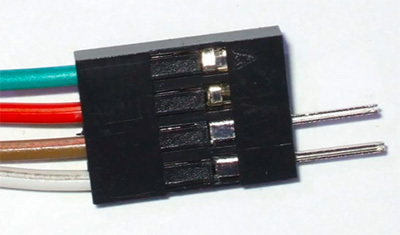 Most of these digital sensors send data using serial communication protocols over a common set of “bus” wires that are physically connected to all of the sensors. Serial protocols can be intimidatingly complex for beginners, but you rarely need to worry about the details because most of the vendors in the Arduino landscape release libraries to simplify the use of the sensors they sell. These libraries make it quite easy to work with complex sensors, and they are one of the reasons that companies like Adafruit and Sparkfun have such a dedicated following in the maker movement. and Installing Additional Arduino Libraries at Arduino.cc. Note that these little bits of library code can be located in several different places on your hard drive but it’s best to keep the ones you add in your sketchbook folder because the Arduino Software (IDE) upgrades itself by first erasing everything in the program root directory: including any libraries that were stored there. Libraries in your personal document folders are not deleted during the Arduino Software (IDE) update process. Here I’ve added a resistor which pulls the CS pin high to tell this ADXL345 accelerometer to communicate with the I2C protocol rather than SPI. 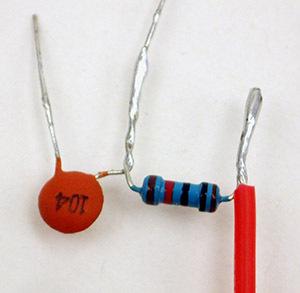 The value of that pull-up resistor is not critical, so they can range from a 200Ω to 10kΩ. 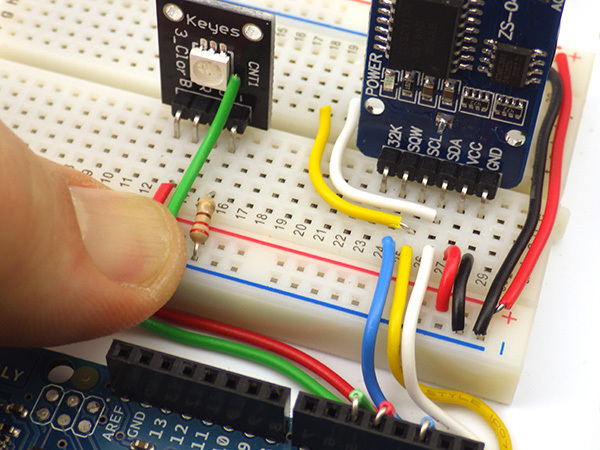 The digital sensor protocols you are most likely to see used with an Arduino are SPI and I2C. It’s fairly common for chip-based sensors to support BOTH protocols and for those you usually add a pull-up or pull-down resistor to tell the chip which one to use. SPI is preferred when fast communication is needed to move large amounts of data, but this is rarely the case for environmental monitoring. 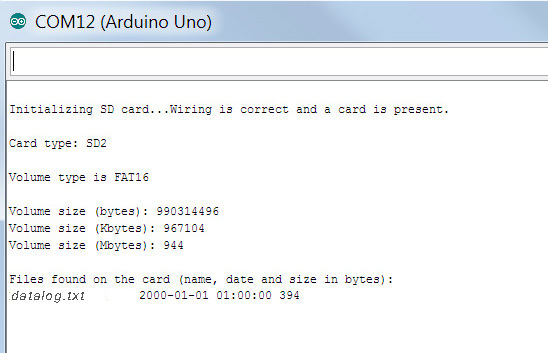 More importantly, the Arduino SD card libraries expect the SPI bus to be operating in Mode0. Adding a sensor to the Cave Pearl Logger which changes the SPI bus to one of the other three operating modes would prevent data from being saved until the bus was reset to Mode0. I have yet to find an SPI-only sensor that doesn’t have an I2C equivalent on the market. 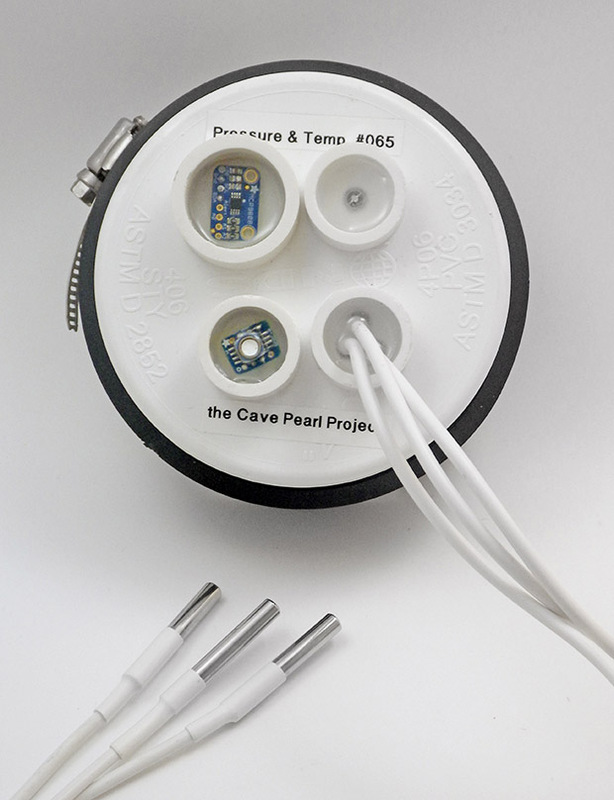 I²C sensors are often the best choice for Cave Pearl Data Loggers. 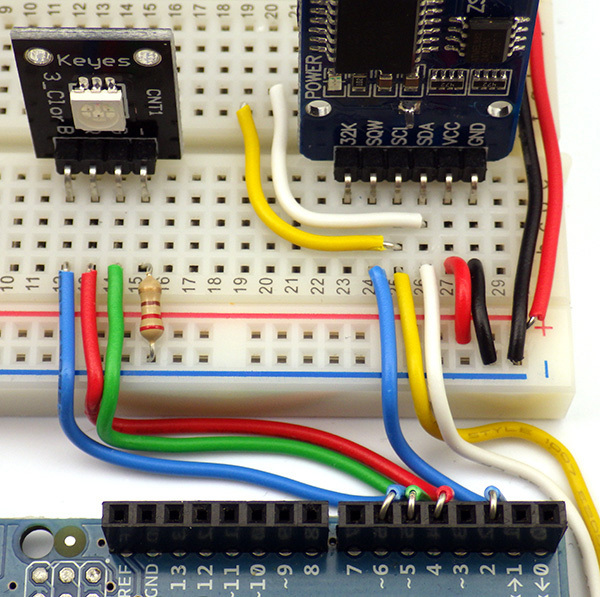 The first thing to do with a new sensor after connecting it to your Arduino, is run a bus scanner which queries every possible address to see if any devices are responding. If two devices are trying to use the same address, only one of them will show up in the scan, and sometimes neither of them will. Code for this basic utility for this can be found at the Arduino playground. 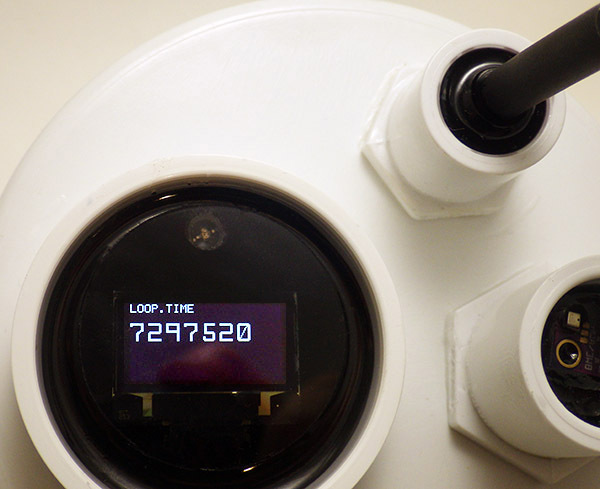 This address is popular with real time clocks – almost all of them use 0x68! Some I²C devices have only one fixed address and but most offer a small range of different addresses that you can set by connecting different pins on the module to power or to ground. This will let you resolve an address conflict, but be make sure to make corresponding changes in your code if you change a sensor address away from it’s default. Most sensor libraries will have a modifiable parameter for the device address that is used to initialize the sensor. If you have a sensor with a fixed address, you will only be able to hook up one of those sensors to the logger at a time unless you add an I2C multiplexer to resolve the address conflict. 1) Find a suitable tutorial by typing “How to use SensorX with Arduino” in Google or by reviewing the tutorials available at: Hookup Guides at Sparkfun, the Sensor tutorials at Adafruit, or search for code examples and links at the sensors forum. Most libraries are written to provide InitializeTheSensor() and ReadTheSensor() functions that so steps 4) & 5) often end up adding only couple of lines to your code. And then in the main loop, the sensor uses a four step process to complete one reading. // the temperature must be read before the pressure! Multi-step read procedures like that are quite common, because it takes time to capture high resolution readings, and in this case the temperature has to be sent as a correction factor for the pressure reading. The pressure sensor returns absolute pressure, and Sparkfun have provided extra code in their library to do calculations which convert that number into sea level equivalent & altitude equivalent numbers. That Sparkfun code example is pretty typical of what you get with libraries for more complex sensors, and it should not be too hard to just open two IDE windows to copy and paste the required pieces of code from the Adafruit & Sparkfun examples into the basic Cave Pearl Logger script on Github. There is nothing magical about libraries: they are just pieces of code that you can read through yourself by opening the .cpp file listed in the same Github repository. I recommend that you always review the library code, as figuring out how someone else’s stuff works is an important part of learning how to program the Arduino. Think about your housing-logger interconnections before you start your build. My current favorite connectors are Deans Micro Plugs, which are available in 2,3,4,5,6,& 8 pin versions. Use a consistent color convention for different bus wires. Most libraries will include a simple example sketch with the downloadable file. These show up in the IDE in the FILE>EXAMPLES> pull-down menu after the library is installed, so you don’t usually have to go all the way to Github like I did here. The included examples usually only initialize the sensor and print out some raw readings, but that’s exactly what you need to verify the sensor is working before you merge those bits into your own code. The real benefit of a good library is not just the code, but the significant amount of time someone spent slogging through a sensors data sheet figuring out the correct sequence of operations. Just because a library exists for your sensor does not mean that it is necessarily a good one – especially when you find them out in the wild. 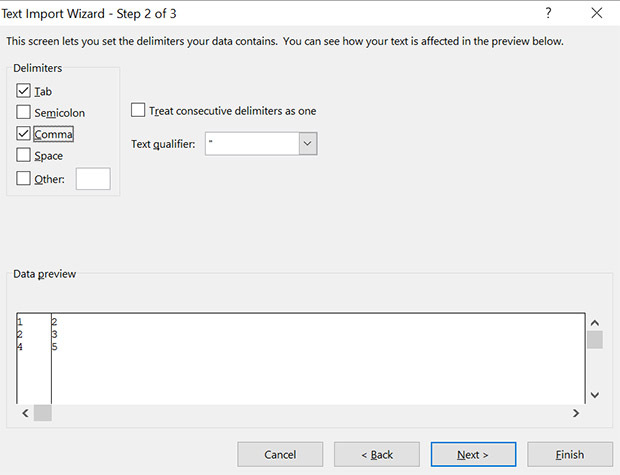 So you should test different libraries when you have options. I generally chose libraries that require the least amount of memory at compile time, and/or ones that give me access to the ‘raw’ sensor readings in addition to the processed output. 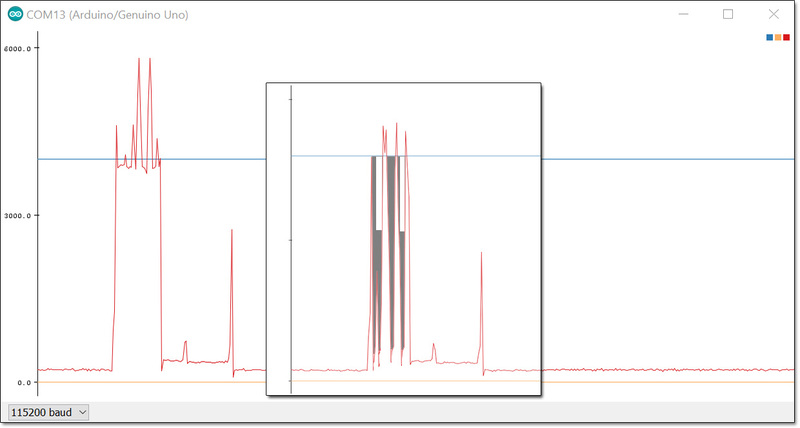 Raw sensor readings let you do calculations later in Excel to make sure the library didn’t introduce an error somewhere. Another thing to keep in mind is that sensor libraries don’t have to be continually upgraded like the software you run into on a more complex system. Once a sensor library is working, it will hang around for years with no updates because none are needed. Well… this post swelled into another voluminous tome, but hopefully no one lost sight of the forest for the trees. Generally speaking you can buy each type of sensor in all of the data output ‘flavors” described in this post. As an example, there are both analog (voltage) & digital (pulsed) anemometers, and the digitals range from simple reed-switch thumpers to ones with onboard IC’s doing most of the raw signal processing to provide calibrated wind-speed numbers over an I2C bus. Don’t mistake the Analog vs Digital divide as any indication that one kind of sensor is necessarily better for the job you are doing. Same goes for my tongue-in-cheek categories for Flippers, Thumpers & Thinkers. They’re just conceptual tools to use when you are hunting through tutorials on instructables, or when you run into an intimidating wall of information like the Interfacing with Hardware page at Arduino.cc. Although this post has been focused on capturing sensor data with a logger, you should also keep in mind that there are many different physical methods to measure the same phenomenon. Using the anemometer example, most people think of the traditional egg-cup spinners because that’s what they are used to seeing on rooftops, but heat-loss methods, and ultra sonic methods are also quite common. A Google search on ‘how to measure water level’ shows the incredible range of different sensors can be put to that simple task. When you are faced with a range of methods like that, the ‘best sensor’ for the job is the one you can actually get working, and that usually boils down to the amount of programming complexity you are comfortable with. 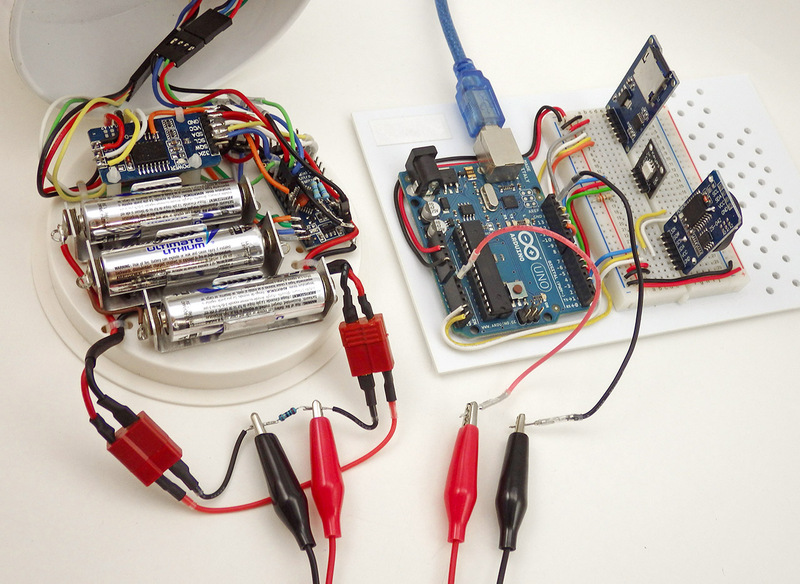 Good libraries can level the playing field quite a bit, making complicated sensors almost as easy to add to your data logger as basic analog voltage dividers. And it never hurts to review the difference between Resolution, Precision & Accuracy before you choose a sensor. A few people have commented about my use of string variables in the basic logger code, and the general consensus is that the String class should be avoided because it can lead to memory fragmentation. It is better to use character arrays, but there is a significant learning curve there and strings will let you build a working data logger when you are just starting out. Majenko has one of the most concise summaries of steps to address this issue, and there is a reasonably good introduction to character arrays, and many other helpful concepts at the Starting Electronics: Arduino Programming Course (see: Section 18). Personally, I find that having to re-jig sprintf() statements when I want to add another sensor to my logger is a pain in the backside. A more memory friendly approach could be to simply open the file and then save the variables directly to the SD card without the string concatenation steps. An alternative way to address String memory issues is to use the Pstring library by Mikal Hart. “Print-to-String” is a lightweight Print-derivative string class that renders text into a character buffer that you define at the start of your program. // so my receiving arrays are usually  bytes long. It does not matter what what the source variable format is – float, integer, etc – it all gets rendered into ascii by the str.print statements. And Pstring will never cause a buffer overflow because any excess data that you try to add to the DATABuffer is simply discarded. 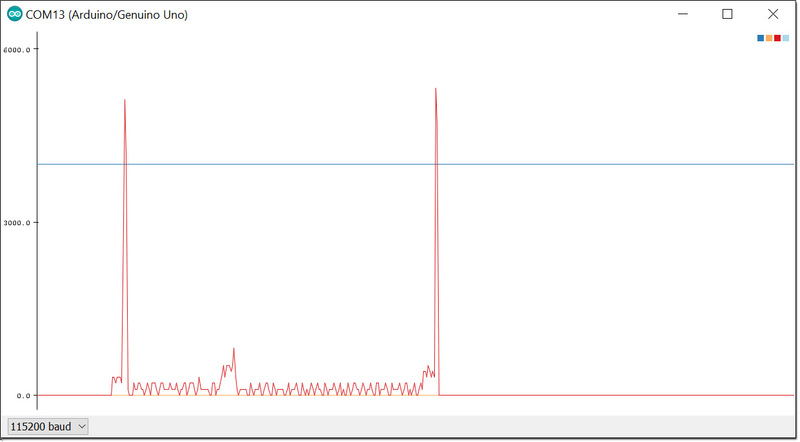 That receiving buffer will always contain valid (i.e. NULL-terminated) C string data. This makes the method much friendlier for people who are new to programming. This entry was posted in DIY Build a Pro Mini Logger, Teacher Resources on December 17, 2017 by edmallon. It’s August, and we’re assembling kits for another run of the instrumentation course. Over time we have come to rely on 328p based microcontroller boards (aka: Arduinos) so I though I would post a list of the parts & materials we use to help others fire up their own classroom. More than a few people have requested this since I posted the UNO based logger tutorial. This information should also be looking to buy an all in one solution for their first citizen science project. 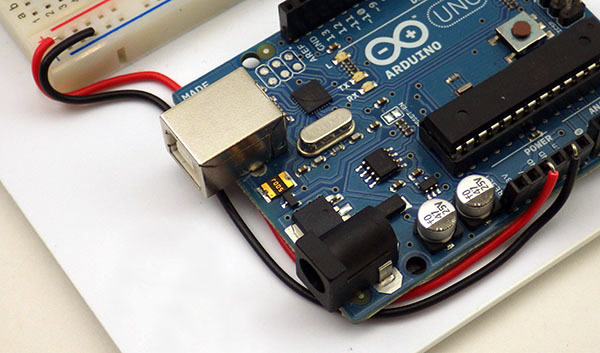 Don’t reinvent the wheel if you don’t have to: there are lots of premade Arduino kits out there. However we found that many had parts we simply didn’t need, as we wanted a minimal ‘starter kits’ designed to exactly match the lessons in a course focused on environmental monitoring. 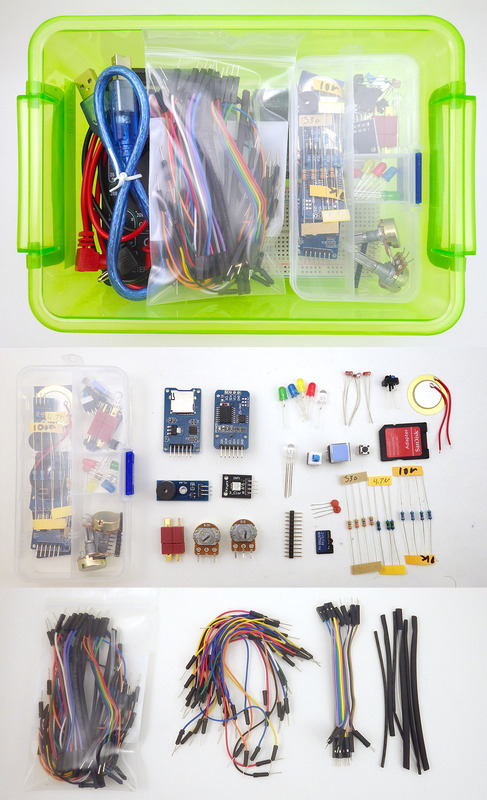 We also hand out extra parts for some tutorials as needed through the course, and the students receive a second project box when they start building their stand-alone projects. 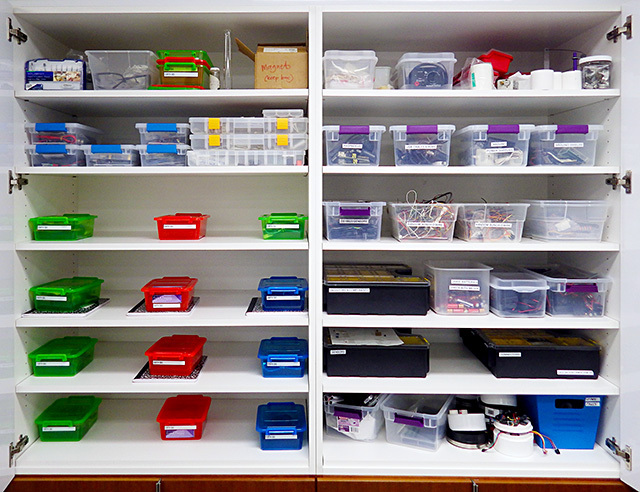 Even if you want that level customization, it might worth looking at some basic electronic component kits, and building your classroom set on top of those. The DIY approach will save money, but you pay for it with time. Most of the eBay parts shown here took about two weeks to ship, with some stragglers taking almost a month to arrive. 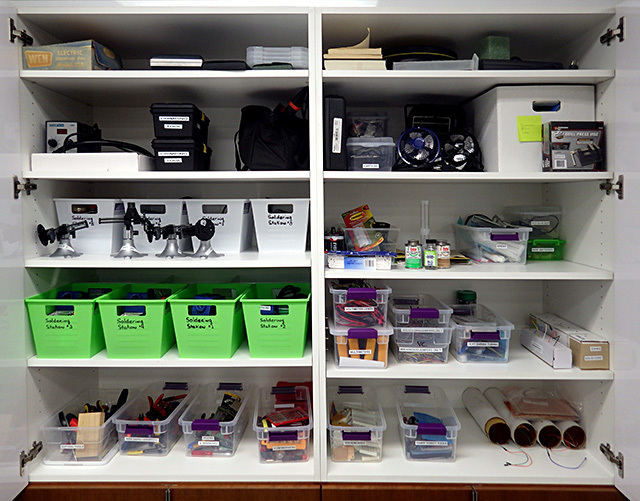 You will need more than an Arduino and a few components to set up a classroom, so I am including tools & other miscellaneous bits of hardware that we use in the lab. I would not describe any of these as high quality equipment, but they are ‘good enough’ to get things rolling on a modest budget. Even if you go with cheapest possible suppliers – you are doing great if you can run a fully developed course for $150 a seat. 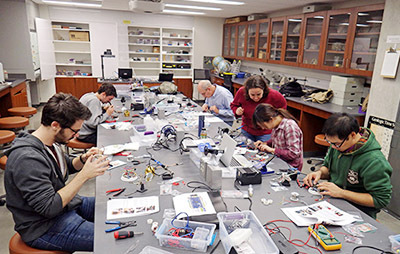 If you purchase a soldering station for every single student, and use UNO’s + a typical Pro Mini logger build, you’re looking at about twice that much for the initial run of your course. To keep all the led’s, resistors, etc. from rolling around loose inside the larger clip boxes. Get ones where the section walls can be removed to make room for longer parts. There’s a range of other cheap fishing tackle and (non-waterproof) compartment boxes available. Makes a reasonable “instant” waterproof housing for smaller projects that indicator LED’s can still shine through. The actual usable “interior space” of the box is 8.1cm x 15.5cm x 3.5mm, which is just a smidgen less than the standard 83mm x120mm acrylic platform bases used for the UNOs (you can press them in, but they are very tight – better to shave them down a bit) Pelican 1020 Micro Cases accomodate that UNO platform easily though they are the luxury polycarbonate option which cost more than 2x as much. 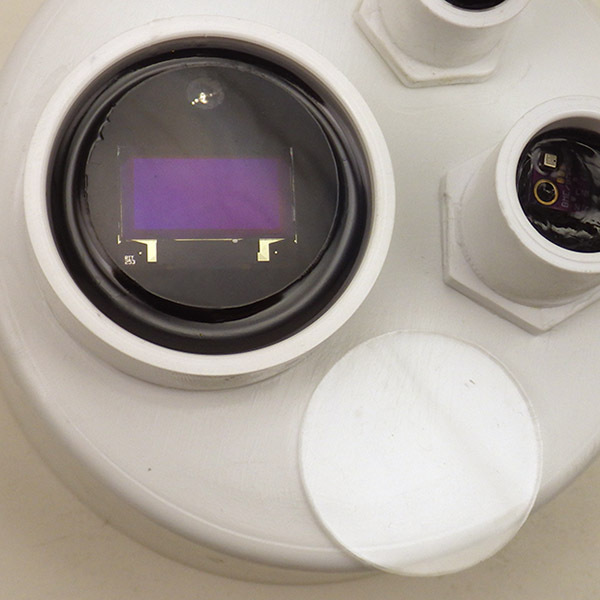 Polyc does allow you to put display screens and solar cells inside the housing because it passes all of the visible spectrum with little loss. Of course that also means that whatever’s inside the case will really cook (60-90°C) if you leave those housings exposed to full sun. Useful for inspecting solder connections. $0.55 ea. Most electronic components can be had for pennies if you buy them in quantity. And the difference between low end parts and name brand stuff can be more than an order of magnitude. That doesn’t mean that off the shelf kits are a bad thing, it just means that what you are really paying for is someone’s time selecting and packaging it. That still might be the better option for you if you can afford it. Resistors: Lead diameter makes a resistor breadboard friendly or not. You generally want 0.6 mm not 0.4mm leads, though it is inevitable that you will end up buying a few cheap multipacks with the thin leads. ( Note: You can add male DuPont crimp ends & a bit of heat shrink to components with thin leads to make them breadboard friendly : see inset photo) Brand-names like Vishay, Xicon, KOA Speer are usually very good, but you pay 2-5 cents each for them. 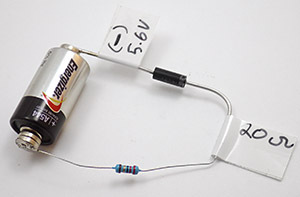 Ironically, the cheap old carbon resistors often tend to have thick steel leads while the better brands have softer copper leads which bend more easily. I find 1/4 watt to be the most practical size and 1/2W metfilms are physically about the same size as 1/4W carbons. Beige-background carbon resistors seem to be much easier to read than blue-background metals, but if you need 1% tolerances, you won’t have much choice. 1/8watt metfilms are very tiny, which can be helpful if you need to put a resistor into a small place, like between two pins on a breakout board. 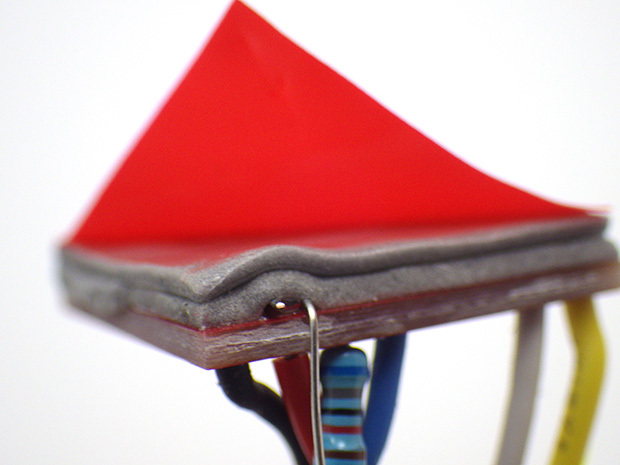 Wherever possible, buy 1% tolerance (or better) resistors, rather than 5%, as this affects your sensor accuracy when you use them in voltage dividers – which is a common way to read sensors. Components: Most hobby market parts distributors have “Assortment Kits” for commonly used components and its a good idea to just buy a selection those when you are starting out. It might be a while before you actually dig into that mixed bag of capacitors for the odd value you need for that circuit you just found on the internet, but when it happens you will be glad you spend that $1 six months ago. Where to buy them: I’m going to list several kits from Electrodragon as examples, but there is nothing special about them and you can often find a very similar sets on eBay for significantly less. A common problem with all the overseas suppliers is that it usually takes 3-4 weeks for stuff to arrive, and that can stretch to 8 weeks. So if you realize that you need something quickly, go to Sparkfun/Adafruit/Pololu/Amazon etc and just pay the $15 delivery charge. The thing that makes this complicated is that now a lot of domestic websites like Amazon, Digikey etc, often just acting as distributor for these exact same components from China. Another draw back with Amazon is that those easily recognized boxes are big targets for porch thieves. My rule of thumb with dodgy flea market sites like Banggood, Dealextreme, AliExpress, etc. is: “If this order never arrives, how unhappy would I be about that?” If the answer to that question is “Quite a bit” then you should order that part from a reputable vendor. More than 95% of the things I order from eBay do arrive…eventually…though it’s common for things like sensor modules to be significantly different than the photos shown in the listing. Overseas suppliers are best used where fakes are unlikely (or don’t matter) like resistors, LEDs, displays, pin headers, switches, wires, vanilla transistors, battery holders and similar items. Or a one-time thing you just want to play with to see how it works. For more complex sensors and microcontrollers it’s very easy to get counterfeits or rejects that kinda seem to work initially, but are way out of spec. In those cases I’m prepared for a percentage of duds, and so far I’ve only had one out of maybe 30 purchases. The cost of returning is usually more than the item’s worth, so you have to be prepared to bear the loss. There are even some complex components I wouldn’t buy anywhere else like the ESP’s, since these are manufactured in Shanghai, so you wouldn’t find these cheaper somewhere else. I rarely use these (unlike the little ceramics which get used all the time) Keep an eye on polarity because electrolytics (and Tantalum capacitors) will explode if you put them in backwards. 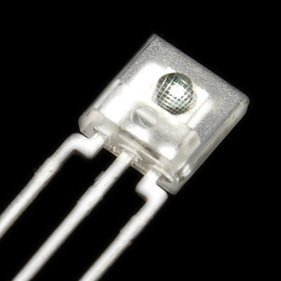 1N4148 is the standard signal diode so it might be worth ordering those. 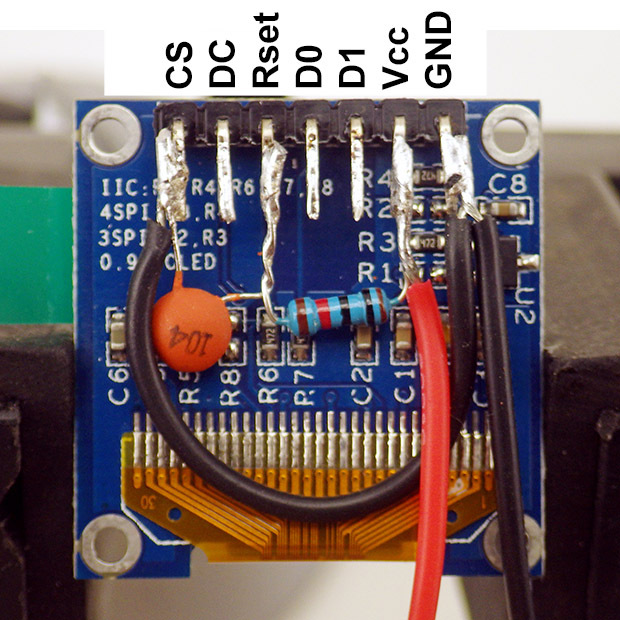 These mosfets are like “Transistors for Dummies” and work great as digital switches when connected to 5v Arduino digital pins – and you don’t have to do the calculations for the base currents, etc. So they are much easier for beginners to use although they will set you back a whopping four cents each. Note: A 100K resistor between the gate and ground keeps the N-fet off by default, but you can generally operate mosfets without a pin-gate resistor, though many recommend 150 ohms there. N-channel mosfets are usually placed on the ground side of the controlled circuit. Note for 3.3v systems: The 2n7000 can be used with a 3.3v Arduino to control things like LED’s, but they only pass between 30-60mA because the controlling voltage (Vgs) needs to be at least 4.5v for the 2n7000 to be fully turned on. With only 3.3v control, the resistance across the 2n7000 is ~ 3-4 ohms, so there will also be substantial voltage drop across it. Although “logic level” is not exactly as standard term, mosfets designed to work with 3.3v mcu’s often have an “L” in the part number, ex: IR540 (non logic level) vs. IRL540 (logic level). Ideally you want the MAX value for Vgs(threshold) to be lower than 2.4v in the datasheet, or you want to see an RDS(On Resistance) quoted for 2.4v, or lower. When considering the On Resistance, calculate the voltage drop that will occur when the MOSFET is On and the load is operating. If the load draws 50mA, and the RDS(on) is 3 ohms, the vdrop across the fet is 0.05*3=0.15v. The tricky thing about this calculation, is that the On resistance changes with the level of the controlling Gate Voltage, and as you get closer to the Vgs(th)threshold voltage, the on resistance increases – so you need to dig into the graphs on the datasheet to figure out what the actual vdrop is going to be. Since the whole point of using a MOSFET as a switch, is to achieve lower Vdrops than you would get using a BJT, you want the vdrop across the FET to stay below 0.25v maximum. Probably the closest thing to a 3.3v version of the 2n7000 would be one of the Supertex TN0702 or TN0604, which come in the same TO-92 package. They can’t switch much current, but if you are careful it is possible to control parallel mosfets for increased capacity. You can solder legs onto SMD parts to make them breadboard friendly. When you move away from raw sensors, there seems to be a bewildering array of ‘breakout boards’ and ‘sensor modules’ for the Arduino and they sell them in mega bundles of twenty, thirty or sixty different pieces. Like the component kits it is probably OK to get one of these when you are starting out; just to play with them and see which ones fit your curriculum. Watch for custom connectors that force you to buy extra cables & interface boards. I actually like the Grove System, and similar systems like the Itead Electronic Bricks, but from a teaching point of view those are better suited to creating ‘snap together’ lessons with younger students. (or no wiring at all if you populate a Multi-sensor Expansion shield) That’s not so good if you want them to become comfortable making their own circuits on a breadboard. These boards take an analog voltage, compare it to a threshold, and then produce a digital on/off output on Dout which you would read on digital input pins on the Arduino. Essentially turning an analog sensor into a kind of switch. This is such a generic circuit, that you could put other resistive sensors on those pins and it would work fine. Look for boards that give you the 4th analog output pin if you want to read the actual sensor value with the ADC. In addition to modules, you also run into integrated circuit sensors where more electronics are embedded inside the sensor itself. These can have either analog, or digital output, but the digital output is no longer limited to simple on/off information . Analog sensors are generally easier for beginners to use, since all you have to do is read an ADC pin to get your numbers. The digital sensors have to “talk” the Arduino, and that usually involves including a library at the start of your sketches to handle the low level details of the serial communication protocol. There are far to many to cover here, so I will just leave you with a comparison of two sensors that have nearly identical sensing capability, with one being analog, and the other as digital. Equivalent pairs like this exist for other environmental parameters like pressure, humidity, etc. Making the transition from simple analog to true digital sensors is like earning your merit badge with the Arduino. 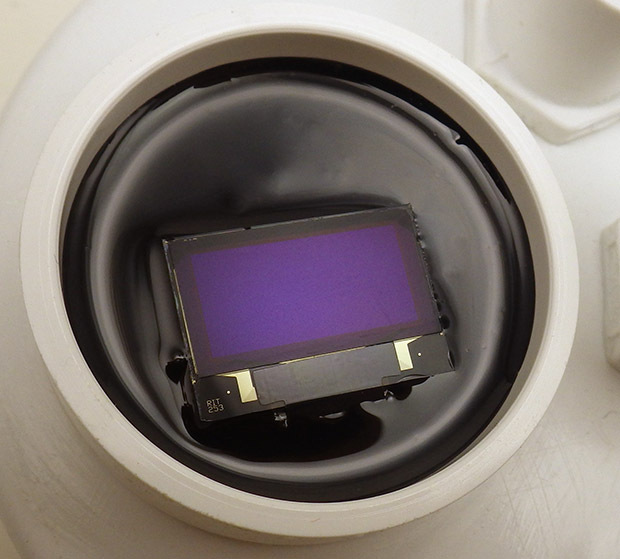 There is usually a digital version for every different kind of analog sensor at about the same cost, and in some cases the digital version offers tremendous advantages in terms of resolution. 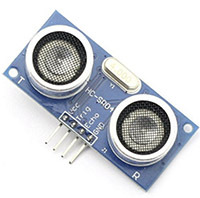 But one of the first things you want to know is: Are there good libraries to make this sensor work with an Arduino? While there are plenty of independent coders posting open source libraries to GitHub, suppliers like Adafruit & Sparkfun often release them in conjunction with a cool new sensor, and it’s one of the reasons why people in the Makers movement like them so much. Though I have listed several low end commodity parts here, I still spend a significant amount at those first tier vendors: both to get sensors I can rely on, and to show them some love for all that hard work. For a more detailed discussion of these options see our page on Adding Sensors ( & Modules ) to Your Arduino Data Logger. Before the comments fill up with dire ‘You get what you pay for…’ warnings, I’d like to point out that when I’m buying tools for myself, I check three places: Adafruit, Sparkfun, and EEVBlog. If you want quality tools go there and buy what they recommend because they really know their stuff. However in the real world a teacher is lucky if they get $500-1000 to spend on materials for a 10-12 student class. See: Collins Lab tool video. Comment: Even if you teach the course with breadboards, you will need at least one complete solder station for things like adding header pins to your breakout boards. A full set like this will set you back about $130, and but depending on your scheduling, you might get by with one full station for every two or three students. We usually set them up around the perimeter of the classroom. It all fits comfortably into these two cabinets, but we could probably get that down to just one if we had to. 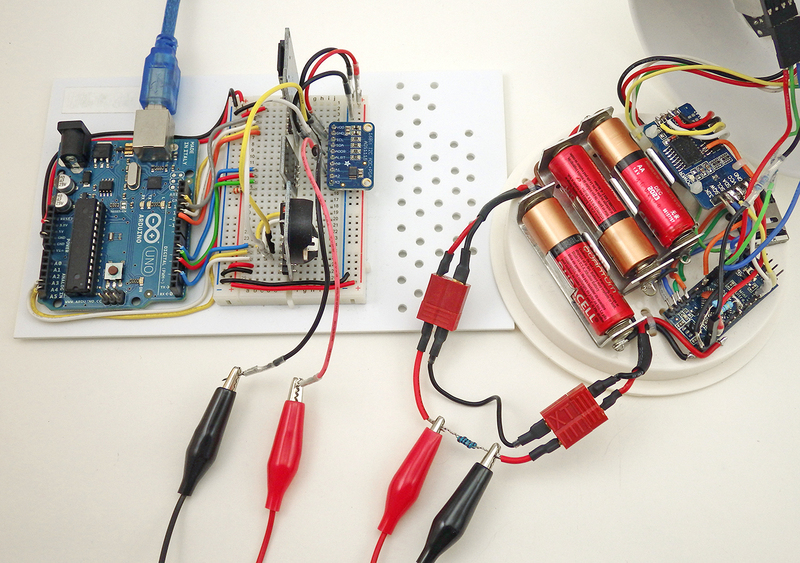 Just found an interesting circuit visualization idea at instructables. It’s a pretty time consuming method, but it’s easy to see how this would be applied in a classroom setting. One of the drawbacks of standard breadboard methods is everything on the underside of the boards is hidden once the pins are in place. You could do this with cheap pre-cut acrylic platforms. There are a few issues that are worth considering though: it only works in chrome or firefox, and everything internet related breaks eventually, and will continue to do so in the future, so you need a backup plan for any downtime or loss of the network. If you experiment with weird new Arduino compatible board variants, there’s a good chance those board definitions won’t be available in Codebender, and none of the libraries I use regularly were there because they were one-of variants that I found after digging through GitHub. This entry was posted in Teacher Resources on August 8, 2016 by edmallon. This post is the second in a series of online tutorials that I’ve been developing to help teachers bootstrap their own Arduino based curriculum. 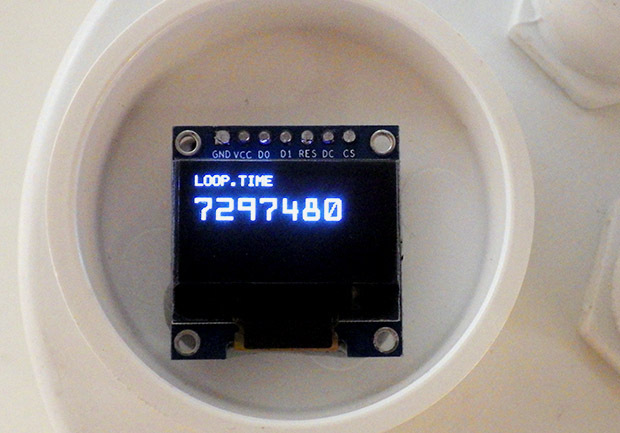 The full set are listed at How to Build an Arduino Data Logger which walks you through the most recent versions in a more or less logical progression. But if that material leaves you in the dust because you are teaching yourself as you go along ( like most people in the makers movement! ) 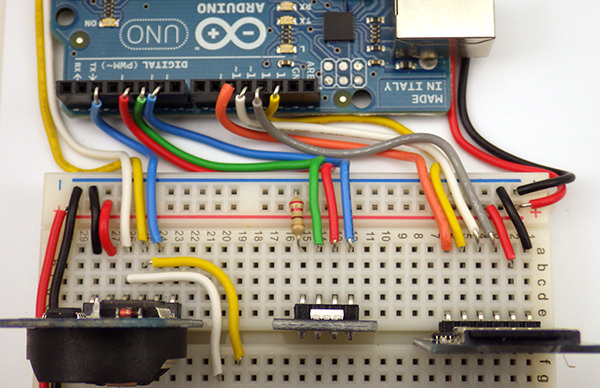 then check out the beginner’s guides & video tutorials in the Ideas for an Arduino STEM Curriculm post. SPI micro SD card adapters like this can be had for less than $1 on eBay, and these can be connected directly to the pins of 5 volt Arduino’s like the UNO or the smaller form factor NANO. (note: the SPI pin labels are on the back). Note: These SD card adapters do not always get along with other SPI devices on the same bus. Similar approaches to assembling a DIY logger can found at other places on the web (including many pre-built data logger combinations), but I thought I would add a quick breadboard logger to my other tutorials for those who Googled their way to this blog looking for something fun to try with an UNO – even if they did not have much experience with electronics. If you go with no-name clones, the approach I’ve outlined here might also qualify as the cheapest option available (…if you are funding the everything out of your own pocket, like some of the science teachers I know…). The key difference between using an (unmodified) UNO, and the smaller pro-mini style loggers described in my earlier tutorials, is that UNO’s operate at 5v, while smaller form factor boards are generally regulated to 3.3v. This limits the sensors you can connect directly to those capable of operating with 5v logic levels, but most importantly it affects the SD cards, as they can only handle 3.3v. So you would need to use a raw adapter board with a level shifter to accommodate the different voltages. Fortunately, SD modules that already have the regulator & level shifter on the breakout board are very inexpensive, so this issue does not add complexity to the basic connection plan. These cheap regulators are notorious power wasters, but most people operate UNO based projects on a USB tether for live sensor data in the serial plotter, or power them via a wall ac power adapter. Stick with cards smaller than 2Gb and format them with SDformater utility (not windows!) to fat16 and test with H2testw. I generally buy 1Gb MUVE music cards from eBay because they are usually genuine; drawing lower sleep currents. WRT Filenames: use 8.3 format and don’t use spaces or special characters. +Various tools including needle-nose pliers, wire cutters, strippers, soldering irons, etc. We attached the UNOs & breadboards to cut rectangles of styrene with the double sided tape to make stable platforms that the students could just pop into their project boxes when class was over. But premade acrylic mounting plates are also available. Before you tackle the assembly, install the Arduino IDE and test that it can communicate with your Arduino. Then there are a few libraries to download and install so that they are available when the Arduino IDE compiles & uploads you programs. I usually begin by removing the resistor highlighted in red to disable the battery charging circuit. There is also a power wasting LED on the RTC board that you can remove as well, but that’s only worth doing if you want to run the logger on batteries. 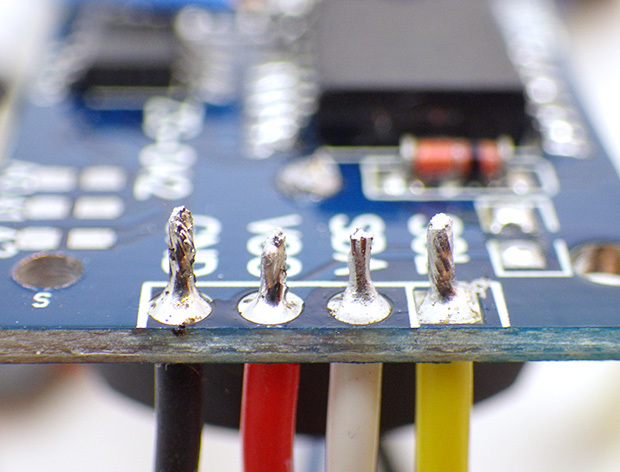 For more details about these cheap DS3231 breakout boards, you can dig into this RTC Post. I have been using these cheap DS3231 RTC boards for a while now. They have proven to be very robust, although they have one element that is slightly annoying: they come with a charging circuit that assumes you have a rechargeable LIR2032 backup coin cell installed. You can use the RTC board as-is if you have on of those LIR’s in your RTC, but since you are not supposed to ship lithium batteries in the post, you almost always receive these RTC boards with no battery, or even worse they will just stick an non-rechargeable CR2032 in there which will pop if you leave it plugged in for long with the charging circuit connected. I usually end up finding a local supplier for non-rechargeable CR2032 coin cells which work fine as a backup power source for the clock provided you disabled the charging circuit by removing the resistor highlighted in red above. You can cut that resistor off with a knife, but I find it easier to flick it off the board with the tip of a hot iron ( I know I promised that this was a solder-less build… but I didn’t say anything about de-soldering 🙂 ) Then insert a fresh CR2032 coin cell into the backup battery holder on the other side. If you forget to put in the battery the logger will still run, but the RTC will forget the date/time every time you shut your logger down, so the time stamps will not be correct unless you reset them every time you start the logger. Bring the ground and 5v lines over to the power rails on the breadboard with some solid core 22 gauge wire. I usually do this at the end of the board that is farthest from the rest of the wires I am patching over. Its worth tucking them in as neatly as possible so that they don’t get bumped around later. Make sure you have stripped enough insulation from then ends that the bare wire penetrates into the riser holes enough for a good connection. Connecting the DS3231 RTC to an Uno: This is possible because the DS3231 has a wide voltage range from 3.3v to 5v. Many other I2C devices would require a 3.3-5v level shifter before they could be connected to the 5v UNO pins. Note: The long red & black wires at the bottom are simply patching power over to the rails on the other side of the mini breadboard. 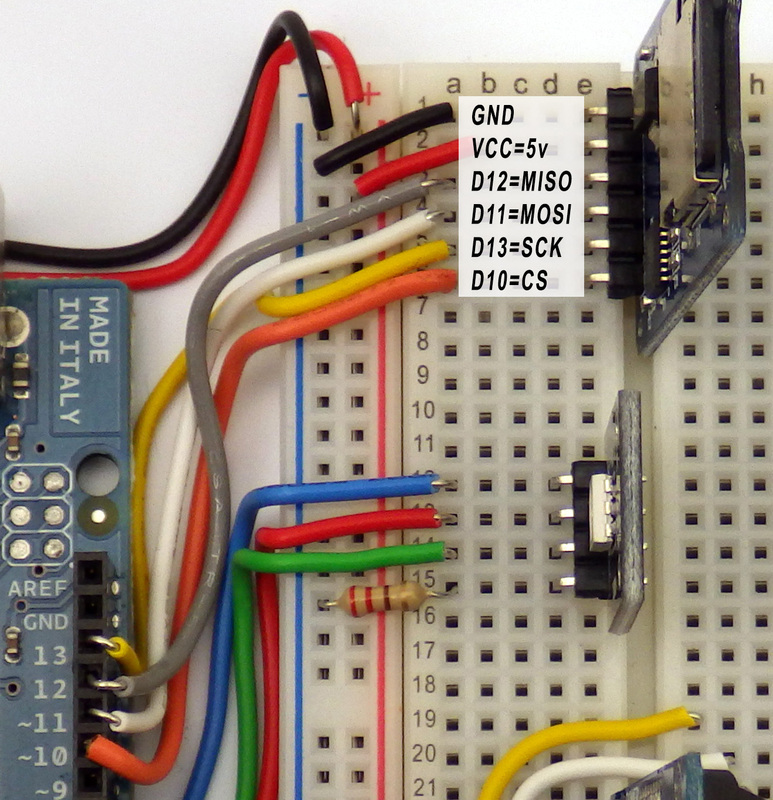 Connect VCC & Ground to the appropriate rails on your breadboard. Since the RTC is an I2C device, it uses the A4 pin on the Arduino as the SDA data line (white) and the A5 pin as the SCL clock signal line (yellow). 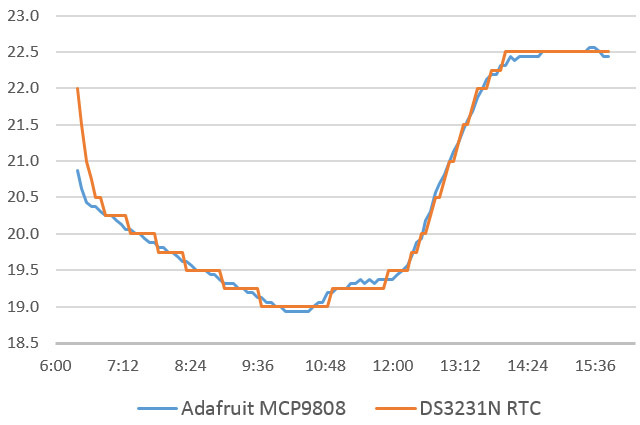 There are many easy to use I2C sensors (that have pre-written libraries) that you may use with your logger, and they will be connected to these lines in parallel with the RTC. ( …if those sensors can tolerate 5v logic levels like this RTC ) To enable I2C communications, this RTC breakout board already has 4.7K pullup resistors installed on those two lines, so any other sensors you wish to connect to the SDA and SCL communication lines will probably not need pullup resistors to function. Many sensor breakout boards also have pullups on them, which you can usually leave in place, provided that the combined resistance of your parallel pullup resistors does not fall below 2.2k ohms. Before connecting any other components to the Arduino you should make sure you have the RTC working. Download the library ZIP file, extract the package, and move the library into your Documents/Arduino/Libraries folder. The moved folder must be re-named ‘RTClib’ for the compiler to find the library and sometimes un-zipping adds extra folder layers that you have to remove to get to the library you want. Update: 2016-10-12: I just noticed that they have taken the setTime & getTime utilities out of that RTC library that were current when I wrote the original post. Now you will need to load File/Examples/RTClib/ds3231_v2 and set the time by following the instructions on screen in the serial text monitor. The new method should let you set your RTC more accurately than using the compile time with setTime. OLD instructions: the greyed out instructions below apply to older versions of the RTClib that were distributed with the gettime & settime utilities. I’ve posted copies of setTime & getTime utilities to my GitHub and there is an alternate version of the setTime sketch with Paul Stoffregens DS1307RTC library, which sets the RTC to the compile time with the command RTC.adjust(DateTime(__DATE__, __TIME__)); but I found I also had to install Paul’s Time Library, to use his version of settime. 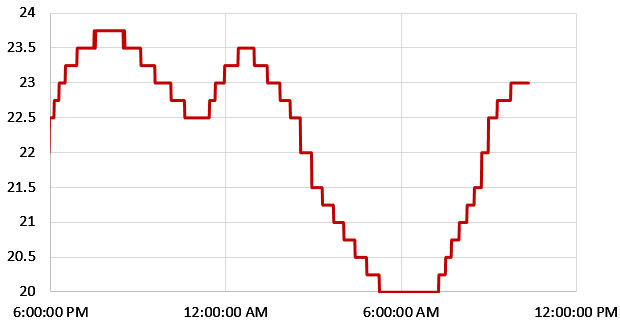 I set my loggers to UTC to avoid problems with local daylight savings time variations. To do this simply change the time zone on your computer before uploading the settime sketch. 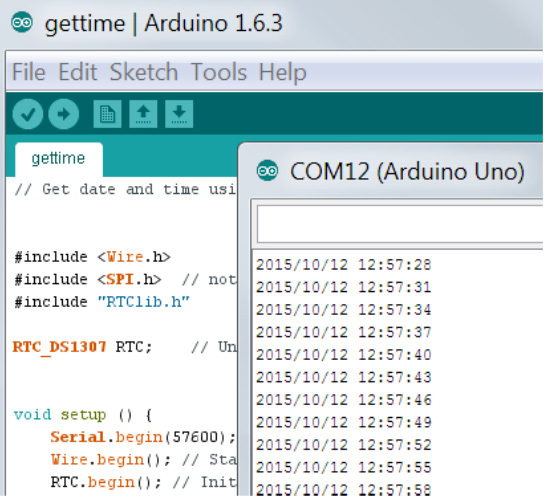 RTClib includes two useful utilities called setTime & getTime that can be found via the IDE pulldown menus after the library is installed at: File / Examples / RTClib / settime & File / Examples / RTClib / gettime Open the settime sketch, verify it, and then upload it to your Arduino via a USB cable connection. This takes the time signature from the compiled code itself and sets the RTC clock with that time. Do not open the serial window while settime is running or the program restarts – setting the time again incorrectly. Immediately after the settime has been run, LOAD the gettime sketch in the IDE and upload it to the Uno. Now open the serial widow, set the IDE serial window speed to match the script, and you should see the date & time being read from the RTC. Technically speaking, if your RTC is showing the correct date and time in the serial window, you can move on to the next assembly stage. However, I usually run other programs to make sure that both the RTC and the AT25C32 eeprom on the breakout board are working properly. Rob Tillaart wrote a bus scanning utility which is quite useful for this: http://playground.arduino.cc/Main/I2cScanner. If you run this utility you will usually find that the RTC is on the bus at address 0x68 and the 4K chip is on the bus at address: 0x57 – although the eeprom can move around from one board to the next. In fact the memory address can be changed to avoid conflicts with other devices by connecting the solder pads provided on the breakout board. On that arduino.cc page you will also find a link to a “Multispeed I2C Scanner” which I like because it scans the I2C bus with different speeds. This is useful as it identifies when your wires have become so long that capacitance is starting to interfere with the serial communication signals and cause the devices to act flaky and/or “drop off the bus”, but the basic scanner works just fine for most cases, especially when you are adding new sensors to your logger and you don’t know their bus address. * I have also found that with some of the cheap UART boards that are needed for Pro-mini style Arduinos, I end up having to set the serial window to 1/2 the speed listed in the arduino code to make them work because they are not consistent with the standard board definitions. But the smaller 3.3v units have their clock prescalars set differently, so this should not affect the Uno based builds. I find that its easier to keep the wires tidy by connecting one end of the wire to the Arduino, and then bend / fold it into place before trimming the other end. Connect a three color common cathode LED to Red=D4, Grn=D5, Blue=D6. A KEYES KY-009 SMD 5050 breakout board is pictured here, but any common cathode LED would work fine. Use at least a 1 kΩ resistor to connect the common ground line to the ground rail on your breadboard, to limit the current flowing through your LED. As the limit resistor gets bigger the LED will become dimmer, but most are still visible with limit resistors up in the 20-30 kΩ range so the value is not critical. You do not need a three color indicator LED, but I find it helpful to put different color led flashes in the code so that I can keep track of what the Arduino is doing when I don’t have it connected to the serial window. So I turn on red for SD writing, blue for eeprom buffering, green for sensor reading, etc. Two extra I2C jumpers (white and yellow) shown here simply patch those lines to the other side of the breadboard. 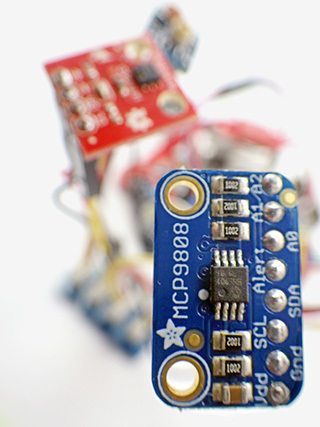 These are not necessary, but they make it easier to add I2C sensors to your logger later without disturbing the RTC connections. The 220 Ω limit resistor pictured here is an absolute minimum, and probably should be bumped up to between 1-10K Ω. Then patch the Ground and VCC lines to the rails on your breadboard. (a) CHANGE the chipselect from pin 4, to pin 10 with: const int chipSelect = 10; at the beginning of the script. We have already used pin 4 to drive our indicator LED’s red channel. (b) ADD #include <SPI.h> to the beginning of the script if it is not there already. 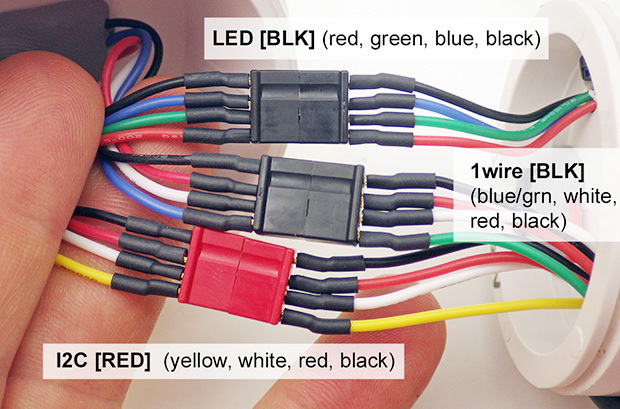 -> The SPI line jumper wires are not in the correct place or you have a loose wire somewhere. There is some variation in the different board pin locations so review these on your board first to make sure you have everything connected properly. Note that your particular SD card adapter board pin-outs may not match my diagrams here, so you will have to adjust for that. -> Your SD card is not formated as fat16 or the card is not inserted properly. I usually use smaller 1-2gb cards, as some of the new larger HDSC cards don’t format as fat16. -> You have a bad sd card adapter board. I have had plenty of crummy sd card adapters with bad spring contacts, so try to have 2-3 of these on hand in case you get a bad one too. Note that some overhang the SD card adapter board needs to sit “in the groove” at the center of the breadboard so that the pins make proper contact. The RTC and LED boards don’t require that, but it makes the build look a bit neater if you move them to match. and your pretty much ready to start using your data logger. The code also puts the UNO’s cpu to sleep between readings, and it wakes up again to take a sensor reading when the RTC alarm goes off. The serial print output is all optional, so you can comment out those statements when the logger is running in stand alone mode. When you start making changes to the code, commenting out the lines you don’t need is generally much safer than deleting them. This script is only meant to provide you with a basic starting point, and it should be easy to add other I2C sensors, or simple analog sensor readings following the example from Arduino.cc . 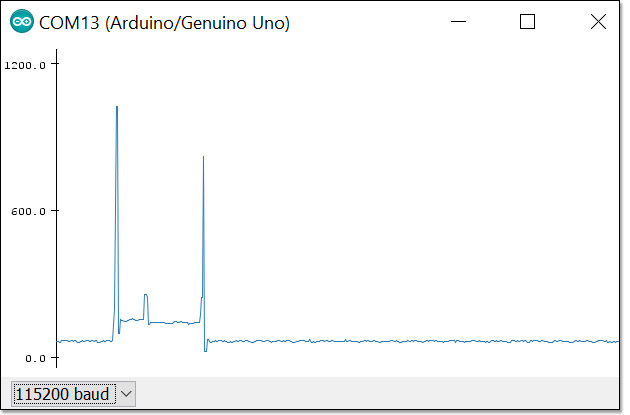 Before you add some new sensor to your logger, spend time searching through the forum at Arduino.cc, as someone has probably already answered any question you might have about getting it to work. When you are just starting out, choose sensors that already have good libraries written for them. It’s worth noting here that this code would also run fine on my pro-mini based logger builds. All you would have to add is a few lines to read analog A0 which tracks the main battery via a resistor voltage divider which is not included in this UNO build. The main Arduino page has a lot of free books and resources as well as explanations for all of the built in code examples. There are also plenty of good Arduino programming references out there if you google around, which should help you customize the script. Six in series AA battery packs like this are fairly common, and should power this basic Uno logger for a few days of stand alone operation – especially if you use Lithium AA’s which have a flat discharge curve. 8xAA packs are available, but you have to be careful that over-voltage on new batteries does not push the total output above the UNO’s 12v maximum. The optimal solution might be to use 7 batteries in an 8-series battery pack, with a simple wire soldered across the last holder. 18650’s in series would be another option. If you need something that runs longer, rare earth magnets (soldered to the ends of jumper wires) make it easy to connect a number of C or D cell batteries into a custom power supply held together with painters tape. 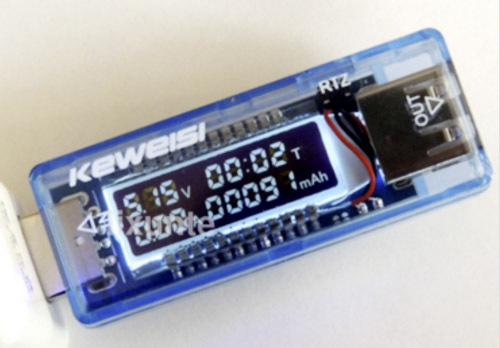 I would not try to power this logger from a 9V battery, as I don’t think it can deliver enough current for safe SD card writing. Rechargeable LiPo shields are also available if your pockets are deep enough. 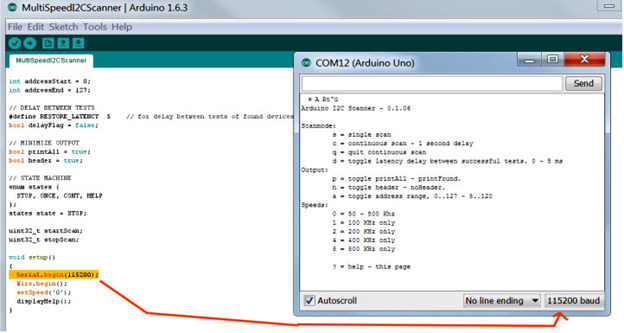 One of the weird behaviors to know about with Arduinos is that every time you open the serial window from the IDE, the program that is running on the Arduino will restart, so if you are writing header data to the datalog.txt in the setup section, you will see a new copy of that header in the file each time the serial window is opened. The easiest way to estimate how long your logger will run on batteries is with one of these USB power meters. 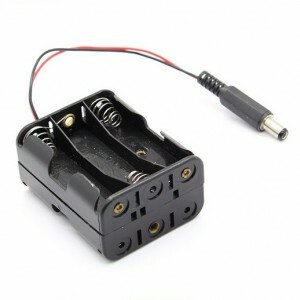 Insert one of these $4 adapters between a USB power supply adapter & the datalogger. Reset the timer and let it run for a few hours and then look at the cumulative mAh number. Divide that into the rated mAh of your battery and you have a ballpark run time estimate. For reference, most alkaline AA batteries provide about 2000 mAh. It is even possible to make your own power meters. 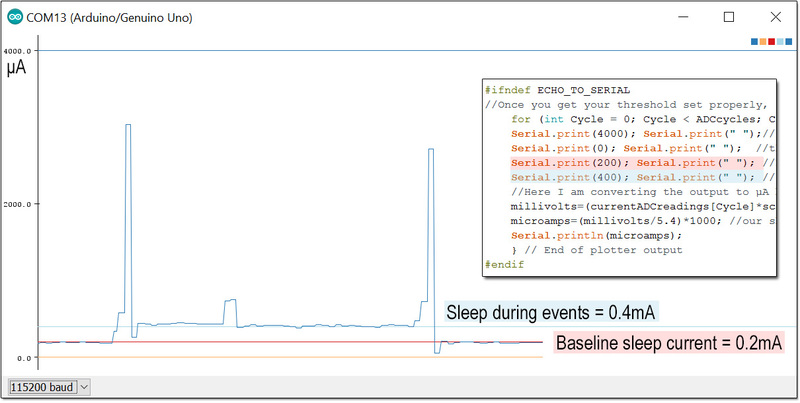 Once you are comfortable with the serial plotter tool in the IDE you can look at other methods for graphing the data in real time. One common method is by using another program called Processing. But be sure you test everything before your classes, as I’ve had some challenges getting processing to work on different windows systems (with the data on the SD card saving the day once again…) There is also an Excel macro called PLX-DAQ that can be used to monitor any serial port and display the data sent through it, but I believe that macro only works with older versions of excel/windows and I’ve never gotten it to work on my versions. Like Processing, it requires a few extra lines of code to be embedded in the Arduino sketch to direct the data to specific cells in the spreadsheet. Plot.ly might also be worth using to share data online in a way that looks professional. And if you are really get the bug, you could take it all the way to the ‘Internet of Things‘ level if you add a shield or two. Home automation & wireless gardening, are popular applications, with some people using Google Charts to display live data on their websites. With the always on UART chip, it’s hard to get an UNO to run for long on batteries, but you should still be able to get few good days out of a set of AA’s with this plan. If you want a smaller footprint, you could bend the pins 90° and connect the RTC & SD boards with a lower profile to one of the many ‘stack on top’ proto shields available. Probably the best of the lot is the Dead Bug Prototype shield for an Arduino UNO (~$24.00), as this shield also lets you run an UNO for a very long time on batteries, though you would have to wrangle with his code a bit to make things work. That shield has the RTC, & SD carrier already built in, so my advice is build a jumpered UNO logger as per this tutorial, then when you get all your code & sensors working properly in tethered mode, transpose what you have learned to create a stand alone unit using the Dead Bug shield. Moving on from there: another option that really helped me at the beginning of this project is the compact TinyDuino platform, which is code compatible with all of the larger Arduino boards so you can usually use your existing programs directly. I used Tiny’s in several of my earliest loggers, and some of them were still running after more than two years. When you are ready to graduate to other small form factor Arduinos like the pro mini, perf-boards & wire wrapping is a quick way to make solder-less prototypes that can be disassembled afterwards. Once you are really comfortable with the different Arduinos, it is even possible to use the raw Atmel processor by itself on the same breadboard as your other parts. Strip-boards are another popular way to go from circuits on a breadboard to a deployable prototype. In the stand alone logger tutorials, I describe how to build a housing from 4″ PVC fittings, but those parts are all available in larger diameters so the same basic idea could be used with the larger UNO based logger, though the caps get a bit expensive at that size. With your ‘deployment’ build ready, you can go hunting for a waterproof enclosure for your combination (here is an example using a prebuilt project box and anti vibration mount), or you could try building something more creative with pvc plumbing. Lego blocks are not waterproof on their own, but they are made from standard ABS, so a little dab of ABS plumbing solvent around the edges lets you quickly assemble very robust internal scaffolds for your prototypes. After UNO based labs, the students move on to pro-mini based logger builds with many different sensor combinations. The Pro Mini is essentially just a stripped-down Uno and uses the same pin mapping. So it is generally possible to transfer UNO logger code into a Pro-mini based build with few (if any) changes to the programming. It’s also worth noting that this UNO logger has been ‘field tested’ many times during Trish’s Instrumentation course. I am happy to report that once the solid core wires are firmly in place, the students were able to reassemble the loggers quickly at the beginning of each class by simply popping the RTC, LED & SD adapter back into place. This saved a great deal of time, and the students used the UNO’s as a code development platform while they built “stand alone” loggers for their final projects. 1) No matter how many times you tell your students to unplug the Arduino from the computer before changing wires around on the breadboard, they will forget, and start changing wires around while the whole system is live. (…making plenty of mistakes in the process) While our Arduinos survived, the USB ports they were connected to sometimes did not. I would recommend that you use a sacrificial powered usb hub between the computer and the Uno to protect the computer’s usb ports from this abuse. 2) The single most common mistake that the students made was forgetting to put the limit resistor on the LED, and a few digital I/O’s were lost from resulting high currents if student failed to notice the the led was unusually bright. (Again, I am amazed the mcu’s survived these events without needing surgery) With younger students, I suggest that you pre-solder a 10k limit resistor directly to the ground line of the LED’s before you hand out the parts so that there is no way to make this mistake. They will still hook the thing up wrong, and three color led’s will light up with unusual color combinations if you ground any of the 4 lines, but I don’t think we lost any digital pins that way. Well looks like someone sent this post to Scrbd. I guess that means you can download it as a PDF from there. Slightly annoying to see advertising over top of something that is being given away free, but more so that their page comes up higher in search results than the original. Though I guess it’s all good in the end, if it helps more people get started with their logger projects. This entry was posted in Teacher Resources on December 22, 2015 by edmallon.